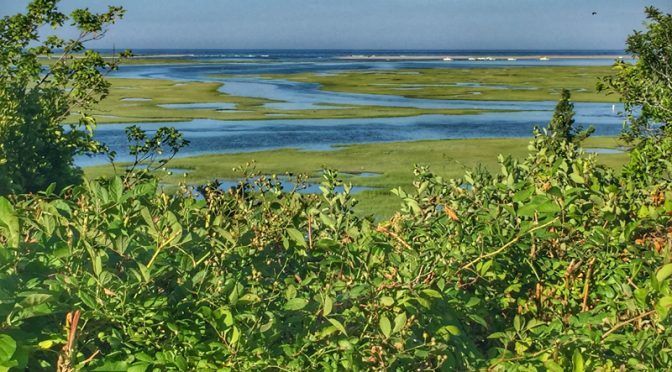 The views over Nauset Marsh to Nauset Spit, where Nauset Beach is separated from Coast Guard Beach by a breach, is spectacular… any time of the day, any time of the year. I really liked this photograph looking through the trees out onto Nauset Marsh from the carving stone at Fort Hill. It was evening but there were still plenty of boats out enjoying the gorgeous summer weather. Pretty photograph, don’t you think? So many blues; so many greens! Beautiful! Thanks, Linda! It looks lush.